Walk in chamber comes in a variety of sizes, from a small box that fits on the bench top to a room-sized chamber for large objects or for testing large batches of product simultaneously. Temperature ranges from -60° C to 150° C and relative humidity ranges between 20% and 90% are available. 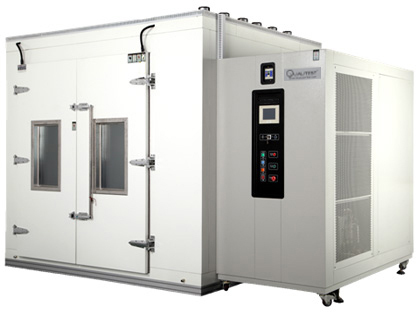 A temperature humidity walk in chamber can also be used when constant climate conditions (temperature and/or humidity) are needed for product testing. Walk in test chamber simulates the effects that a range of temperature and humidity conditions have on a product or material, for example telecommunications equipment or photovoltaic solar panels that are exposed to outdoor temperature and humidity conditions. Graceful appearance, circularly shaped body, surface treated with mist strips and plane handle with no reaction. Easy to operate, safe and reliable.Rectangular double-glassed watching window for the observation of the test production during the testing process. The window is equipped with sweat-proof electrical heating device that can prevent water steam from condensing into droplets, and with high brightness PL fluorescent bulbs to provide light inside the box. Double layer insulated airtight doors, able to insulate the internal temperature effectively. Water supply system that is externally connectable, convenient for refilling water into the humidifying pot and automatically recyclable. The French Tecumseh brand is used for the circulation system of the compressor, capable of removing the lubricant between the condensation pipes and capillaries. The environment-protecting coolant is used for the whole series(R232, R404)6. Imported LCD display screen, capable of displaying the measured value as well as the set value and time. The control unit has the functions of multiples segment program editing, and of quick or slope control of temperature and humidity. Inserted mobile pulley, convenient for movement a relocation, with strong positioning screws.